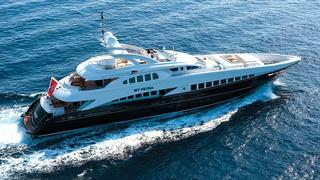 This one took some tracking down, but finally I discover that Y.CO closed on the sale of the 44m motor yacht My Petra, a joint listing with Stuart Larsen at Fraser Yachts and Jean-Marie Recamier at Camper & Nicholsons. Built in 2009, My Petra is one of the Heesen 4400 series that has been hugely popular since its launch. Her streamlined exterior and naval architecture are a joint product of Omega Architects and the Heesen Yachts Design Team. My Petra has a aluminium hull and superstructure with a beam of 9m and a 2.5m draft. She complies with MCA and ABS standards and has cutting edge navigation systems controlled from a control centre onboard. A modern interior was designed by Omega Architects, who have used subtle lighting and fresh neutral tones to create an atmosphere of simple luxury. She has a spacious master cabin, with two further double guest cabins. A pair of twin rooms can each cater for an extra person in Pullman berths, taking the total number of owners/guests from 10 to 12. There is accommodation for 9 crew to ensure a relaxed, luxury cruise. The asking price for My Petra was €22.75 million.